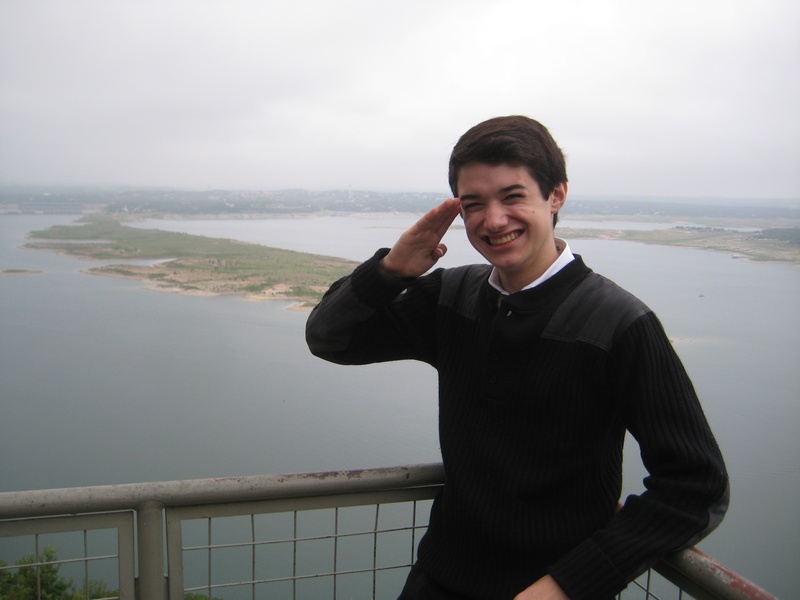 Commander Ben salutes all dyslexic students in front of Lake Travis near Austin, Texas. October is dyslexia awareness month. I want to share with you my greatest tip: advocate for yourself. How can you advocate for yourself through your words and actions? Use your words. Go and talk to your teachers directly, explain your difficulties reading, and ask them for their help and understanding. Do the best that you can in your subjects, even the small assignments. This will show that you’re a hard worker, and you don’t let your dyslexia hold you back. Stay positive. Not only will this help you in coping with dyslexia, this will prove to others that you’re resilient and strong. You won’t allow the challenges of your learning difference to get you down. As dyslexic students, we have more challenges than other young people, and I believe that helps forge us into steel. Steel is very strong, and our experiences, our efforts to overcome challenges, and even the failures that we learn from will give us the strength to achieve great success in the future. I made the Sound of Reading documentary last year to help shed light on the struggles of having dyslexia, and how Learning Ally has helped to provide audio versions of textbooks and other printed materials to dyslexic students and those with learning difficulties. Their audiobooks give students, like myself, the opportunity to learn and be successful. At last year’s book festival, I had the opportunity to interview director Luis Macias about his Embracing Dyslexia movie. Many thanks to Ms. Mandy Tucker and Rawson Saunders for giving me the chance to talk with the director and the talented students from the Rawson Saunders school. In 2014, Rawson Saunders students will also be sharing their latest works. Be sure to visit them if you’re at the Texas State Capital this weekend for this year’s Texas Book Festival. The Embracing Dyslexia film found success with Kickstarter, but not right away. Director Luis Macias shared his experiences with crowd funding during my interview with him during the Texas Book Festival. When he first set out planning for his film, Mr. Macias knew about Kickstarter and crowd funding, but his first foray with a Kickstarter project met with failure. He just had a video of himself looking at the camera explaining what his project was and what he wanted to accomplish. He raised about only $7000 out of his $24,000 goal. Not having met his goal, his fundraising efforts failed and he would have to start all over again. But his first project’s failure provided him with valuable experience. He discovered that it was important to have your base, people who know about you and your project. You also want to have a video to show some of the work that you’ve done. After his first project ended without funding, he reached out to the people who had initially supported his project to see if they were still interested in donating. If so, they could do so through his website, and Mr. Macias raised about $5500 that way. That was enough to help him get started and take the first trip for his film. When he tried his second Kickstarter project, he had Twitter and Facebook up and running, as well as people who already knew about the project. He also had some filming that he already took and he was able to put together a trailer for his project pitch. At the end of his funding period, he raised $13,600. $1,600 over his new goal of $12,000, making his Kickstarter project a success, which helped him finish his film. Mr. Macias loves films, and he is a video editor with many years of producing documentaries and corporate videos. To film Embracing Dyslexia, he didn’t want to go the regular video camera route because he couldn’t get the film quality he wanted. Instead, he shot his film with two DSLRs, still cameras that also record HD video. Mr. Macias he went out with his cinematographer, who handled the cameras. Mr. Macias handled the sound and helped with the lighting. Watch the entire video series with Luis Macias and learn more about his film and dyslexia. Thanks, Mr. Macias, for creating your Embracing Dyslexia film to help educate parents, students, and educators about dyslexia. Sometimes, teachers and educators may recognize that their students have difficulty reading, but they don’t want to mention the D-word because they’re afraid to label kids. With his film, Embracing Dyslexia, director Luis Macias has set out to remove the stigma of dyslexia by helping to educate others about this learning difference and get kids the help they need sooner. Mr. Macias was motivated to create the film because of his son Alejandro. Due to his learning challenges, Alejandro repeated first grade, but they didn’t find out what was causing his reading difficulties until he was in second grade when they had him tested. At that point he was diagnosed with dyslexia. The delay in finding out about his son’s dyslexia and the knowledge that he could have received reading therapy earlier weighed heavily on Mr. Macias. He didn’t want other parents to have to go through the same experience. I had a chance to interview Mr. Macias about his Embracing Dyslexia movie during this year’s Texas Book Festival. You’ll find my videos with him as part of this blog post where he shares his journey and advice for parents and dyslexic students. In my write-up below, I’ve designated my additional comments with “CB“. When Alejandro’s principal and teacher were informed about his diagnosis, they were on-board to provide some accommodations, but his son’s principal didn’t want to call it dyslexia. She called it the D-word, which took Mr. Macias aback. Why didn’t she want to use a word that would give students and parents an idea of what’s wrong? They didn’t want to label the kids, but it’s important to know about dyslexia so kids can get help. Dyslexia wasn’t a curse. Mr. Macias was disappointed that the school knew about dyslexia, but didn’t want to talk about dyslexia with parents and students. Mr. Macias went to see Susan Barton talk about dyslexia and that inspired him to create his film to help others learn about dyslexia, and to help educators and parents get the help their kids need. When he first started working on his film, Mr. Macias didn’t know much about dyslexia, and he worried if his son would be able to continue to go to school or later to college. He found there were a lot of myths, but he wasn’t sure if it was because people didn’t know about dyslexia or because there was misinformation. Dyslexia affects a lot of people—by many estimates 1 in 5 have reading difficulties. Mr. Macias asked, if it affects so many people, how can we ignore it? He needed to get the information out to let dyslexic kids know that they can blossom as adults. For students who have low self esteem, he wants to tell them that they are smart, but they just learn in a different way. He wants to figure out how to get dyslexic students the tools they need so they can blossom as students and later as an adults. Even though it will require a lot of work, Mr. Macias is confident that his son will be able to do whatever he wants in life. As a first step for parents, Mr. Macias recommends that you educate yourself about dyslexia. Search for resources online, including many of the resources on his Embracing Dyslexia website. Second, understand that dyslexia is something that is brain based. It’s not because kids are not trying hard enough or because they don’t want to do it. It’s hard for readers, those who have not had problems with reading, to understand. Be patient. be supportive, and find the strengths in your child. Don’t just focus on the negatives and what they are not good at. Find the talents that your child has and help to nurture them. When you talk with your child’s teachers, find out if they know what dyslexia is. If not or if they only know about the myths, help them learn about dyslexia and how it affects your child. Find ways for you and they to work together. Most teachers want their students to succeed. If you can educate your teacher, that’s a beginning for your child and the other dyslexic students in your child’s classroom. Having to educate all your teachers in middle and high school can be hard, especially since they may not believe that dyslexia is real or they believe the myths about it. When you’ve met one dyslexic, you’ve met one dyslexic. Mr. Macias said that he interviewed someone who said that “when you’ve met one dyslexic, you’ve met one dyslexic.” No two dyslexic are the same. They all have their own personal struggles in different ways. This makes it difficult because the way teachers can help one dyslexic may not be the best way to help other dyslexic students. In addition to working with your teachers, you need to higher a tutor, specifically a tutor that knows what dyslexia is and who can teach kids in a way that will help them learn. The International Dyslexia Association can help you find tutors in your area. CB: I’ve worked with a lot of tutors, and when you can connect with them, you can go far. Like Mr. Macias tells his son, you’re going to have to work harder than other students to get the grades that you’re going to get, but you need to believe in yourself. Dyslexia is not you. Dyslexia is a different way of learning, and you are still a smart student who can accomplish whatever you want. Yes, you may struggle with reading, but you will have success in other areas. CB: On a personal note, I find that dyslexic students have to push through so much that it helps them mature faster than their peers. Mr. Macias shared that after he and his son learned about dyslexia, his son’s attitude changed about school. One of his favorite subjects is math. He has a tutor and his reading ability is improving. Mr. Macias said that his son uses the iPad, the iPhone, and a computer from time to time, such as for research. There are still times where his son is really struggling, but he helps is son as best he can. CB: On a personal note, in the beginning, I didn’t want to accept that I had dyslexia. I didn’t want any help. I thought that I would figure things out and I would be fine. If you have dyslexia, you have to come to accept your dyslexia in your own way, and once you do, you’ll be stronger for it. But eventually, I accepted that I had dyslexia. I found that I had to practice, work, and push through with everything that was available to me—my own strengths, available technologies, and accommodations for my learning style. I encouraged other dyslexics in my school to look for help and go to our school’s learning center where they can get assistance and tutoring. Math is a hard subject for me since I have dyscalculia and dysgraphia in addition to dyslexia, but as I work more with math problems, I’m able to understand the concepts easier. Some dyslexic students can read relatively well after reading tutoring. With my severe dyslexia, I still struggle with reading even after many years with reading therapy. The letters look 3D, as though they are jumping around. Sometimes I can see the letters, but I can’t get the word. Back in kindergarten, I would say things like cat as “ct” because I couldn’t recognize the vowel. And don’t get me started with confusing “b” and “d”! Here are more videos about students experiences with dyslexia that I took at this year’s Texas Book Festival. My thanks to Ms. Mandy Tucker, Assistant Head of Lower School at Rawson Saunders for her assistance with all of the interviews. Update: Watch the entire video series with Luis Macias and learn more about his film and dyslexia. Thanks for sharing my journey with me. During this year’s Texas Book Festival, I had a chance to interview students from Rawson Saunders about their experiences with dyslexia. In my first video, Emmett shared his challenges and successes with dyslexia, and in this, my second interview in this series, Faith talks about how she found out that she was dyslexic and her strategies for finding success. I hope that you or your dyslexic students find inspiration from my interviews with Emmett and Faith. Faith found success as an eighth grader at Rawson Saunders, but that hasn’t always been the case. In first grade, before she started at Rawson Saunders, she noticed that she was different from other students. They could read fluently, and she had to stop a lot and go back over the words. She used to love to have books read to her in kindergarten, but when she started first grade, she didn’t want to pick up a book nor did she want anyone to read to her. That’s when her mom and dad had her tested, and she learned about her dyslexia. School can be a difficult time for those with learning differences, but from her first day at Rawson Saunders, Faith felt at home with other dyslexic students. She didn’t have to worry about being made fun of by teachers or students. Each dyslexic student has different strategies for learning, and Faith finds that focusing on what needs to get done and getting the longer tasks done first helps her learn best. She also reads to her parents and has her parents read text back as a review. She likes math, and they’re covering algebra in her eighth grade math class. Faith aspires to be a teacher and doctor. She enjoys expressing her feelings through painting and music, and she strums on her guitar to help refresh her thoughts. Her message to other dyslexic students is that it does get better. Don’t think that because your dyslexic, you’re not smart. Dyslexic students will need to work harder, but if they keep at it, they will find success in life. Reassuring and inspiring words from a future Dr. Faith! Every year, the Texas Book Festival gathers authors and book enthusiasts together in Austin, Texas, to celebrate reading for entertainment and knowledge. Unfortunately, reading can be a challenge to dyslexics, and this year’s festival included a documentary film, Embracing Dyslexia, and presentation from director Luis Macias to help others learn about dyslexia. Ms. Mandy Tucker, Assistant Head of Lower School at Rawson Saunders, invited me to join her, students from Rawson Saunders, and Mr. Macias to talk about their experiences about dyslexia. I jumped at the chance and met them on October 26 on the grounds of the Texas Capital. Here’s the first interview in this dyslexia video series from the Texas Book Festival. Emmett, an eighth grader from Rawson Saunders, noticed that he was different from other students in his class. He needed more time on tests and had trouble spelling. He felt different from the other students, and this led to him being diagnosed with dyslexia when he was seven years old. When he first learned about it, he freaked out, but his mom reassured him, and then he became relieved to know that his learning difference had a name. Attending Rawson Saunders has helped Emmett feel good about his learning difference. He feels at home with other dyslexic students. It’s a big difference from his old school in New York City. Rawson Saunders in Austin offers academic language therapy (ALT), which helps with the reading and spelling parts of dyslexia. It’s also greener in Texas! At school, Emmett learns best through visual learning and class discussions instead of individual work. He also has no time limits on tests. Watch my video interview with Emmett where he candidly shares his experiences with dyslexia, his challenges, and his favorite subjects: science, math, film making, writer’s workshop, acting, and more! When he’s older, Emmett wants to be a scientist with NASA, Space X, or other companies that want to explore space. Emmett reassures other dyslexic students that they have a gift, and with his talents, Emmett is well on his way to be the next Columbus in the Milky Way.